I’m surprised the mint and parsley have lasted this long, in their big fired pots out on the patio. But as the days get shorter and colder, both herbs have faded. So I have now picked the nicest leaves and put them in the freezer. The mint goes in a water-filled spare ice cube tray; I don’t bother making parsley ice cubes, but chop the herb and chuck it in a freezer bag instead. I can pull the herbs out when I need them, and I expect that they’ll last until my fresh mint begins growing again and I can grow some new parsley from seed. I like the mint cubes in mojitos! 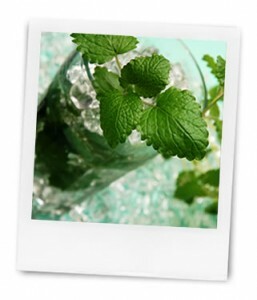 I’m lovin’ the mint ice cubes for mojitos idea! I’m currently in the process of making and freezing massive amounts of pesto from the basil in my mom’s garden. It’s great to have all year round for an easy dinner. Very interesting. Can’t say I’ve ever seen a parsley based salad – probably a bit too sophisticated for the likes of this country gal!